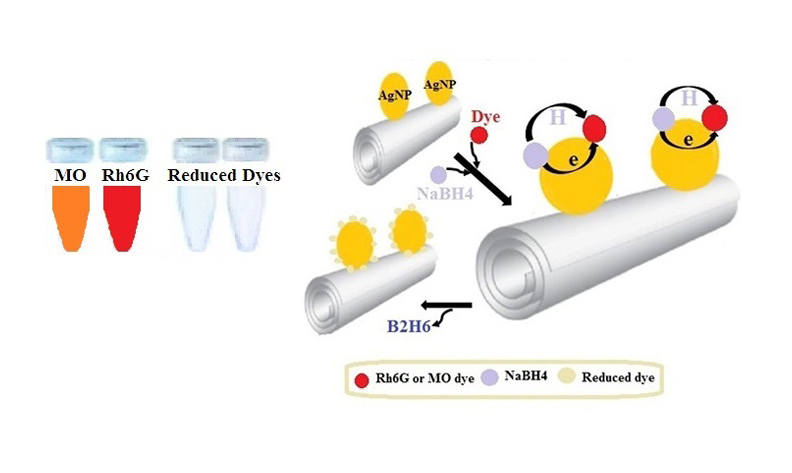 Halloysite nanotube supported Ag nanoparticles (Ag/HNT) as catalyst for reduction of Rhodamine 6G (Rh6G) and Methyl orange (MO) have been synthesized and tested. 3-glycidyloxyproyltrimethoxysilane and Triethylene tetramine were successfully utilized to modify the HNTs surface, then Ag+ ions were reduced to AgNPs on this functionalized HNT surface. The structure of AgNPs-impregnated HNT wall was characterized by FTIR, XRD, TEM, FE-SEM and EDX showing the AgNPs to be 10-15 nm in size. The catalytic activity of Ag/HNTs for Rh6G and MO reduction was investigated by UV-vis spectroscopy so as catalyzed and uncatalyzed reaction rate constants could be compared. The rate constant (k) of Rh6G and MO reduction was calculated for catalyzed reactions as 0.224 min-1and 0.222 min-1, and for un-catalyzed reactions as 0.049 min-1 and 0.014 min-1, respectively. The Ag/HNT catalyzer was effectively recycled six times without appreciable loss of activity. Results indicate that supporting AgNPs on HNT surface functionalized with other compounds with superior performance in reducing Rh6G and MO dyes exist.